"Our research shows that synchronization is an effective intervention, especially for patients with low adherence." 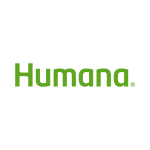 LOUISVILLE, Ky.--(BUSINESS WIRE)--Research from Humana Inc. (NYSE: HUM) and Penn Medicine has shown that when all of a patient’s prescriptions are refilled on the same day, patients are more likely to take their medications as prescribed. The study, published in the August issue of Health Affairs and authored by Jalpa A. Doshi, PhD, an associate professor of Medicine in the Perelman School of Medicine at the University of Pennsylvania, found that synchronizing refills increased medication adherence by 3 to 5 percent among Medicare patients taking multiple prescriptions to treat hypertension, high cholesterol or diabetes. For patients who showed poor adherence going in to the study, adherence increased by 9 to 13 percent. 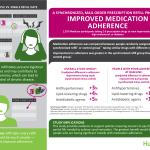 Previous studies have routinely found that improved medication adherence leads to better health outcomes and lower health care costs. In the study, refill dates were aligned—or synchronized—for Medicare patients who were filling between two and six prescriptions for common chronic illnesses through a mail order pharmacy. Their results were compared to a control group of Medicare patients taking similar drugs with different refill dates. 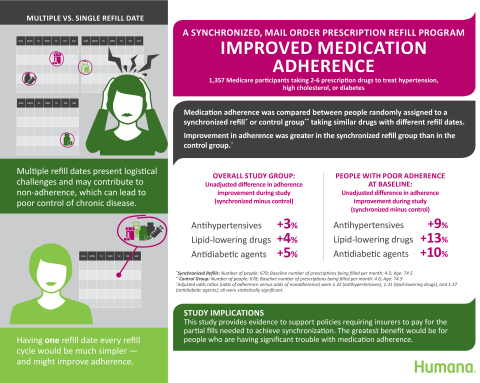 Patients with synchronized refills showed improved adherence of 3 to 10 percent compared to 1 to 5 percent in the control group. This means synchronized refills increased adherence by 3 to 5 percent. Patients who began the study with lower baseline adherence showed even larger increases. They improved adherence of 23 to 25 percent compared to the control group’s improvement of 13 to 15 percent. This means synchronization improved their adherence by 9 to 13 percent. For people taking multiple medications, especially those with chronic illnesses, having prescription refills scheduled on different dates presents logistical challenges that may make it harder for them to take their medications regularly. Although many pharmacies are able to synchronize refills, insurers are not required to pay for partial fills needed to synchronize in all states. This study’s findings provide evidence in favor of the benefits of allowing synchronization of refills. Doshi partnered with subject matter experts from Humana to conduct the study, including clinical analytics expert Victor F. Lawnicki, Data Scientist, and pharmacy expert Joseph J. State, Consultant. Other authors include Raymond Lim, Pengxiang Li, Andrea Troxel and Kevin Volpp, all of the University of Pennsylvania, as well as Peinie Young, formerly of Humana.